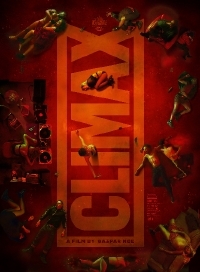 Leading up to its North American debut at TIFF's Midnight Madness, Gaspar Noe's Climax is getting a renewed marketing push and though the trailer suggests this is a dance movie unlike any other, we also have a few more details about the events that unfold in Noe's new descent into madness. Sofia Boutella (Kingsman: The Secret Service, Atomic Blonde, "Fahrenheit 451") stars as Selva, a member of a troupe of young dancers who gathers in a remote and empty school building to rehearse. The group soon delves into an all-night celebration that turns ugly when they discover the sangria they've been downing is laced with LSA. Queue the craziness! I preferred the first far more cryptic trailer for the movie but in all honesty, I was sold at the words "dance movie." No release date on Climax just yet but expect more after the movie's debut at TIFF in a few week's time.